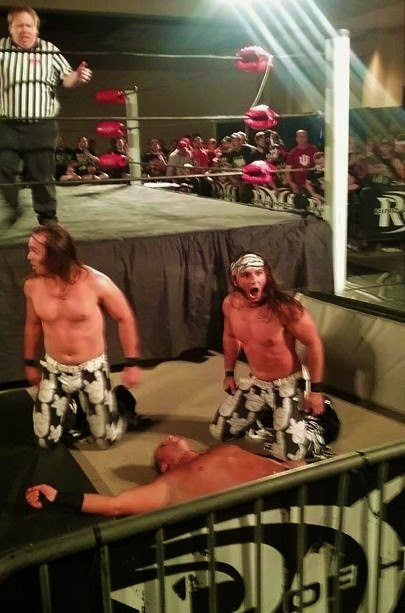 That’s what the Young Bucks’ tour keeps doing- chugging along at a pace unlike anything we’ve ever seen in independent wrestling. The Bucks’ whirlwind cavalcade has captured the attention of not only the nerdiest of wrestling nerds, but the coolest of the cool. The Jackson Brothers are almost viewed as the garage band of pro wrestling, the kings of the underground. Younger, die-hard fans of the sport love the fact that they perform off the grid and on their own terms, while their pop culture appeal has also caught the eye of the uber-hip. In May, Rolling Stone followed around the Bucks and published an article documenting not only their rise to success, but their resistance to ‘sell out’. In refusing to travel shakedown street to Stamford, they only add to their mystique by keeping their act just slightly in the dark. Despite that, they’ve still managed to become famous, perhaps even in spite of themselves. The tour bus rolls on, with the Young Bucks seemingly gathering an even bigger flock of fans as they go. Their appearances are more like Grateful Dead concerts, with their festival-like atmosphere and total audience interaction. The Bucks seem to genuinely relish the chance to be in every city and touch every fan. And while the Brothers Jackson have sometimes been critically panned by the more traditional wrestling crowd, there’s no denying their appeal and financial success. The Bucks have never had a global marketing machine backing them, yet their merchandise sales rock. They, along with friend and business partner Kenny Omega, have marketed their own apparel brand. Much like Jerry Garcia and the boys, they were smart enough to know that their rabid following would want to identify themselves. And like the Deadheads, fans of The ELITE don’t really care where or when the (superkick) party is happening, just as long as there is one. Ironically, The Young Bucks t-shirt now hangs on the wall in Hot Topic… not very far from the Grateful Dead tie-dyes. And those loyalists wear the colors of the family proudly, whether its in Riverside or Rio. The Bucks have criss-crossed the planet and picked up a flock of fans that defy any age or cultural barrier. With The Bullet Club’s god-like status in Japan, they have already forged an incredible career there. Much like Omega, who has captured the imagination of the singles division, the Jackson brothers are considered the top international tag team. At this point, the Bucks could just make a career, and likely a small fortune, doing what they are doing now. It’s something they alluded to during their interview with Rolling Stone: They don’t necessarily long for the validation of a bigger stage. For the most part, these guys seem to enjoy the beatnik lifestyle of the road, and the underground image that has become their calling card. In the “Grater” scheme of things, the Bucks represent a new era of wrestling. One where the wrestlers manage themselves and their own careers, right down to the marketing and branding. It’s an American Beauty of a success story, and a model that other young wrestlers should follow. As it stands, the Bucks are content where they are. They don’t mind the plane flights or the long, winding roads. While the audience seems to be waiting for the day they get tired of being wrestling’s version of Woodstock, they haven’t sold their bandannas yet. Mainly because, they don’t really have to. Remember— the Dead toured for 51 straight years. That’s a lot of superkicks. And, do you know what else? That’s freedom, baby… FREEDOM.